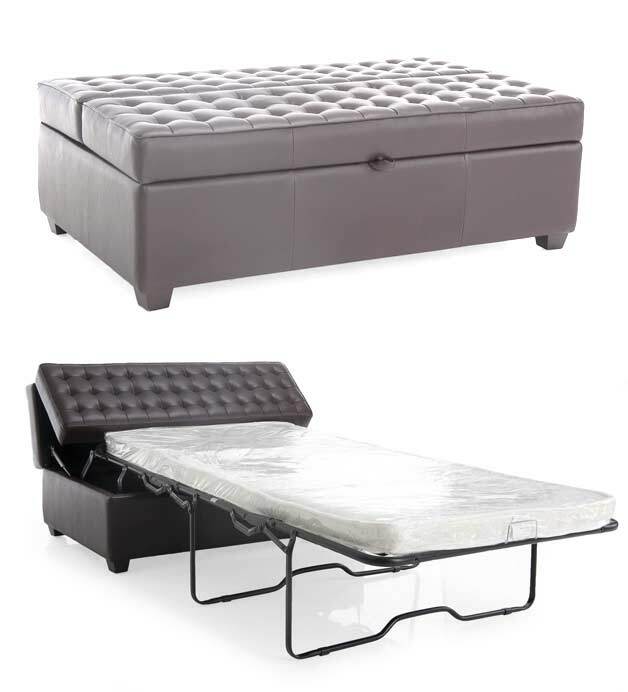 Space saving beds are some of our all-time favorite furniture. There are so many good ideas out there and people have been really creative. Let’s look at some of the absolute best eye-candy when it comes to beds for small spaces! These bed solutions will save you a ton of space and help you get the most of our every square inch in a small apartment. How much space should you have around the bed? How can I save space in my bedroom? How much are Murphy beds? These beds are really great. They enable you to hide the bed completely during the day. Without having to sacrifice any floor space. Instead, you use some of the vertical space. We typically have plenty of vertical space and when you use the platform for a desk or a lounge area (for sitting) you don’t need the full height towards the ceiling. This first version of the slide-under platform bed is a simple construction. There are many other great designs. These beds that slide under a raised floor are always bespoke solutions especially designed and built for a specific apartment. Because they are built into the floor you cannot buy these beds – you will have to design it yourself or work with a designer and a carpenter. The next one contains a lot of storage built into drawers. You don’t notice the storage when the cabinets and the storage area are closed off. This is a great way to hide the bed and when you need to sleep you just pull out the bed and go to sleep. You can store the comforters and pillows in the drawers beside the bed. The last platform bed we will look at is this genius slide-out bed that is built into a platform in a studio apartment in Paris. The architect behind this space has designed the bed so you can pull it out halfways in order to use the bed as a sofa. This way you get an extra function for when you are having guests over. This is important for studio apartments as you need to be able to have everything in one single room! The platform beds are probably the easiest DIY type of space saving bed you can have. You just build a platform and you are done. The design can be really simple if you don’t add a ton of storage drawers. Here’s a picture to illustrate how simple the wooden construction can be made. This be is probably homemade. We haven’t been able to find a designer or manufacturer so we just leave it here for inspiration. It’s a good and simple idea. It looks like something you can easily build yourself. You just pull the chair away from the table and you are ready to go to sleep. If you don’t mind sleeping on the floor this is a great way to hide the bed. You will need to clean the space often and vacuum it in order to keep dust and dirt away. But if you are ok with that you will have a cheap and easy solution! And people will never guess where the bed is hidden! You can also get this functionality with Murphy beds (a lot more on these later!). Here’s another similar design where you have the bed hidden below the desktop. It’s a pretty clever solution as well where you can mount the mattress at the back of the tabletop. It’s a nice DIY project as well and something you need a little more skills to work out. The turning and locking mechanism need to work properly for you to sleep on top of it! This design is really cool and we found it at a design store in Copenhagen called “Smart Rooms”. It’s closed now but here’s one of the best designs from them. We have put it here as a video because it’s quite hard to show it with pictures. This system was so easy to operate and you can see how precise and elegant the lines are. The table will fold up above the bed unit and you are ready to pull the bed down. And voila!.. you are ready to go to bed! You can find some Murphy beds with a desk mounted on the front for sale here on this fine shop. You also get a combined desk and bed with a standard loft bed. It’s not as sleek and nice as the model above but it’s cheap. I used one like the one below for a while before I got married and it worked just fine. You can find these online at low prices. They are quite easy to assemble and you can easily move them. They are great when you need a desk and a bed in your space. You can find these loft beds from $150 online (with shipping). Let’s continue to some of the best space saving beds there are. The wall beds or Murphy beds. They come in many designs and shapes and they have become increasingly popular over the last decade. We LOVE Murphy beds and we have written a lot about the different models are designs there are. Here are some of the classic designs as well as some of the most creative solutions. This is the basic Murphy bed that will fold up against the wall. It will fold up and down and hide away during the day. It is built around gas pistons so it won’t fall on you. It’s well balanced so even a child can lift it up and down. This is a twin bed and in this picture, the designer has placed bookcases on each side. We found this clean and classic design at an online store. We found it here for $1,100. There are a ton of different types of Murphy bed designs. Let’s take a look at some of the other great designs. Next up is our own take on the Murphy bed. We have built-in storage behind the bed. You can also have it sideways mounted. We have made our own bespoke solution that fits our room exactly. It’s not an easy DIY project but it can definitely get done. Here’s a picture where our bed is folded down. You can read more here about our DIY Murphy bed. We built the whole system over a weekend with some help from Maria’s dad. He’s a carpenter and we used his workshop to get everything done properly. Here’s a picture of the storage shelves behind the bed. You can flip the headboard down to access some of the storage space and you can also open the two cabinets on top of the headboard. We have used it every day for more than 5 years now and it still works perfectly! We have designed a daybed with short legs so it can stay in place when the bed folds down. The table is also 20-30% lower than normal coffee tables. It’s very practical to be able to keep the daybed and the coffee table below the bed during the day. You can see parts of the table and the daybed below the bed at the picture above. This is what it looks like when the bed is folded up. You can also have Murphy beds with a sofa in front. This is a great solution if you live in a studio apartment because the bedroom will also be your living room. You can see some really amazing studio apartment design ideas here, including a ton of ideas for beds. There are several great designs and these we have found here are white and stylish. They are great for a small space with limited space. You can find these beds (and a ton of other great Murphy beds!) on this awesome online store. We have talked quite a lot with the owner of this store and they do a really great job. We can recommend them for high quality! We have dedicated an entire post to these types of beds. Here you can find everything you want about Murphy beds. You can also “hide” the bed under the ceiling. This is great when you have an apartment with a high ceiling. It’s a great way to utilize the space below the ceiling. These ideas are a little harder to construct and build as you need to calculate and measure really well to ensure you build a safe construction. But if you are handy and you know your way around the toolbox you can definitely pull this off. Here’s a great example of how you can build this type of bed yourself. It’s a great idea to add some clothes and storage below. You can also have a writing desk. Anything you can design that will work with a low ceiling can fit under here. A TV-lounge with a lot of pillows or a sofa would also be a great idea. You can also build this in the middle of the room and use the space beneath as a cozy lounge or a studying space. You can also go with a solution that doesn’t require you to mount a sleeping loft into the construction of the house. The example below is basically just two bookcases and a simple wooden structure to hold the bed. When you add the ladder on the side you have a sleeping loft. Who wouldn’t love to sleep up there? it looks super cozy. But you really need a high ceiling to pull this one off! The images below are from an apartment space we filmed in Amsterdam called Zoku Space. It’s brilliant in so many ways and you can see a full article here with all the cool features from this tiny apartment. They have designed some tiny and very clever studio apartments with everything you need in only 258 sq.ft. (24 m2). The sleeping area is hidden behind the wooden panels. The picture below was taken from inside the sleeping area. Notice how they have opened up the back of the room so air can flow through. It’s important to think about the airflow when you decide a room like this because you need fresh air where you sleep. Especially in the summer months where the air can get hot and humid. You can also build a very simple system where you mount a piece of wood on top of a combination of a closet and shelves. Two closets can also do it. This is another homemade solution. I like how easy this is and how you utilize the space above a wardrobe and a desk unit. It’s all about finding that unused space whether it’s vertically or horizontally. In this case, the best place to hide the bed was obviously under the ceiling as the closet didn’t go all the way up to the ceiling. If you don’t feel like installing bed into the walls, the ceiling, or the floor you can choose a free-standing mezzanine. It’s basically a structure you built up from the ground with a platform on top where you can place your bed. It’s not super advanced but the cool part is that you can buy these as a kit you just assemble. They can be made of metal and look like a huge pallet rack or they can be more stylish. You get a sleeping deck without having to completely rebuild the whole apartment. These types of constructions are tough to build yourself as you need support legs of metal for it to hold the weight. If you were to build this type of construction of wood you would probably take up too much of the floor space. We have filmed countless tiny houses and homes and we have seen some really cool sleeping lofts. These are some of the most creative and space-saving solutions we have come by from our photo shoots of tiny houses. The first example here is from the Chattanooga company. You have a staircase to the right and the sleeping loft to the left. The guys have also built in storage below the stairs. Here’s a picture from the other angle. Below the bed, we find the toilet and bathroom which is possible because the ceiling is really high on this model. If I remember it right, the architects have maxed out the dimensions of this tiny house. I think this is as high you can go if you want to be able to tow it behind your truck. Here’s a pretty cool floorplan where you have a sleeping loft at each end of the house. It’s from a Danish design and you can see a video of it here (+ 10 other great tiny houses). When you have the option to completely built up a house or an apartment space from the ground there’s obviously much more room for creativity. Chest beds are pretty cool as well. They are kinda similar to Murphy beds in the way they hide away in a closet. But you can store this bed in a smaller closet. They are not super comfortable and you probably shouldn’t offer these solutions in apartments for seniors. But they are simple and easy to operate and they are not dangerous at all (around kids). Even if kids pull out the system there’s nothing to fall over them. These beds can be found at the best price here at Amazon and over here at Wayfair. Chest beds are great because they are relatively cheap and they can fit in everywhere. In most rooms, you will have space for a dresser-style piece of furniture and these beds can be really great guest beds. For young people, they can also be used on a daily basis. But the mattress is typically a foam-type mattress as it will have to be able to fold like you can see on the image above. So you won’t find a heavy spring mattress with this option. For a guest bed, you can also consider an ottoman bed. It’s a good way to hide an extra bed, and it’s also a good leg rest for the sofa or a way to get a few extra seats in the living room. It’s a thin foam mattress because it has to fold into the ottoman, so it’s not the most comfortable choice, but for a night or two once in a white, it’s definitely better than sleeping on the floor. For a solid spring mattress, you will typically have to go with a Murphy bed or one of the sofa beds below. We also have a ton of cool bed and sofa combos. The classic sofa bed is great but there are many other (new) designs as well. Let’s start with the classic sofa bed that has been around for many years. This design is simple and the sofa doesn’t look bulky when the bed is hidden inside it. The mattress is great and you could probably be fine using this on an everyday basis. We found this model online here. You can also have something entirely different. It’s probably best as an extra guest bed. A great idea if you want to be able to pull out an extra bed when you are having guests over. Or if you rent out your space on Airbnb, you can use this to advertise an extra sleeping spot. You can probably find more comfortable solutions but this design wins the price as the most simple triple-function furniture unit. We hope you have enjoyed all these bed solutions for small spaces. It can be hard to figure out the best way to fit in a bed in a small space but with these designs, you should be good to go. You need around 3 feet of space on at least one side of the bed. Otherwise, you will not be able to access it properly. You can place your bed up against the wall in order to save space as long as you have 3 feet of space on one side. You typically don’t need as much space around the bed as you think. But it also depends on your body size and how the bed is constructed. If the bed is very low you generally don’t need as much space around the bed area. A low bed or a mattress on the floor is much easier to get around compared to a platform bed or a tall bed. We advise you to test it out first if you want to move the bed as close to other furniture as possible. You can typically move it unless you are building a loft bed. We have a door that opens inwards into our bedroom and our Murphy bed folds down beside it. So the space from the wall is the width of the door plus a few inches. This works fine and has for years. Here are some general tips on how are you can save space around your bedroom area. These are ways we have seen people save a lot of space in studio apartments as well as tiny houses and small houses. We often have unused space below the ceiling and in our bedroom, it can make a big difference to be able to get rid of some of the seasonal clothing. These are just great. You can find them here online. This is something we have written a couple of helpful articles on. You can go here to check our article about a minimal wardrobe. If your bedroom is really tiny you can always consider storing your clothes in the bathroom or in the living room. If you have a large living room you might be able to fit in a drawer or a dresser there. As long as you can get to it easily it shouldn’t be any problem. I an tiny apartment it never takes much time to get from one room to the other. We have most of our clothes in our bedroom but we do store some seasonal clothes and extra jackets in other drawers in order to use a very small wardrobe. This tip doesn’t give you extra space but it sure will feel like it. If you have dark or strong colors on the walls the room tends to seem smaller. By choosing white or very bright colors you can make the room seem bigger and feel like you have more space. We don’t want unnecessary clutter in a tiny room. We need to work with what we’ve got and what we can and cords need to go. You can fix them on the walls and on the floor. Here we have a lot more ideas on how to optimize a very small apartment. As we mentioned above, the Murphy beds have become more and more popular over the last decade or so. This also means that they have become much cheaper. For a long time, Murphy beds were super expensive and they didn’t really make a lot of sense unless you could build them yourself. We have written a separate article with links and information on where you can find the best and cheapest Murphy beds online. We built our own Murphy bed many years ago before these amazing pieces of furniture became affordable. Go to this article, to see where you can find cheap Murphy beds. Murphy Beds typically cost around $1,000 and the price can go really high if you are looking for the high-end models.